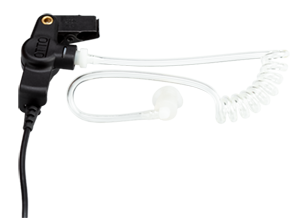 A lightweight earphone featuring a small lapel microphone with low-profile pin-clip attachment for transmission of voice communications. 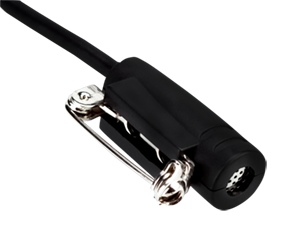 The rubber ear tip speaker mount is held in place via a blackened collar clip. The PTT switching mechanism is mounted in an aluminum, black, barrel -style switch housing. - designed to be positioned and carried in the hand. All cables are Kevlar reinforced for added linear strength. The low-profile, flexible, transparent acoustic tube is replaceable and designed to be compatible with multiple styles of ear tips. 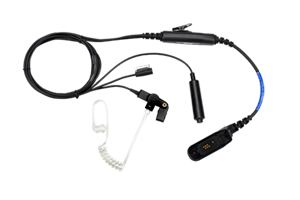 Each kit includes a coiled ear tube with varied sizes of ear tips. The design is universal allowing for use of other types of ear tips.